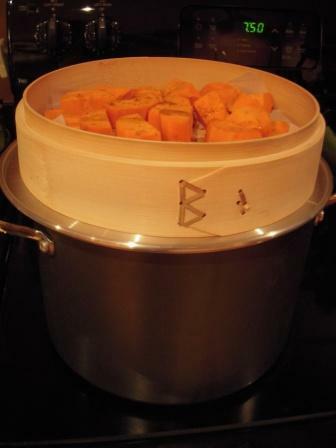 My sister Sharla gave me a great set of bamboo steaming baskets for Christmas this year. I need all the help I can get with healthy, quick meals for week nights. I have endless recipes for the long, labored Sunday dinner, but I fail miserably when it comes to the quick ones! 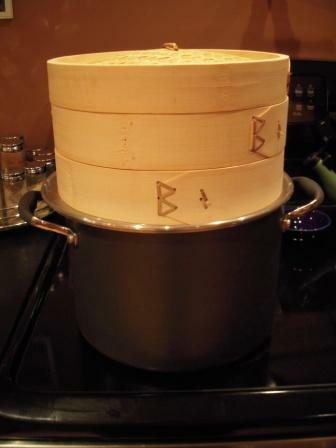 The concept of the stacked baskets is to put the items that require more steam to cook on the bottom and keep going on up. For example, if you had three layers, you would do potatoes on the bottom, fish in the middle, and spinach or greens on the top. 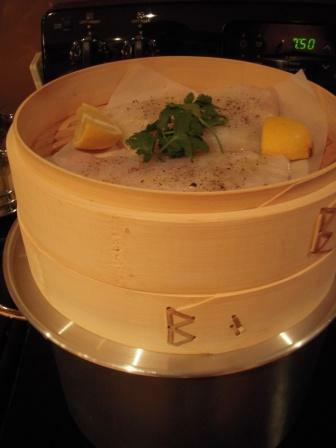 Each one needs less steam to cook in the same amount of time, so everything finishes at once! I lined my baskets with parchment paper to keep the fish from seeping into them, but many say you can line them with a piece of cabbage or lettuce. I’ll give that a try next time! 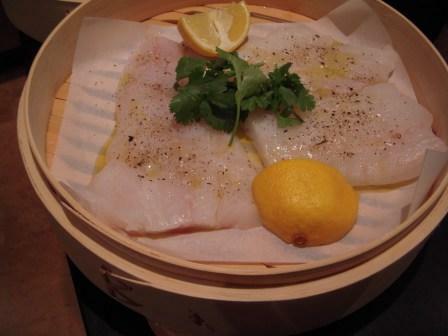 In one layer, I put two filets of True Cod (the only fresh/wild fish at the market this week – so ready for summer now) with a tiny drizzle of EVOO, some salt, pepper, a little fresh cilantro, and a 1/2 lemon. 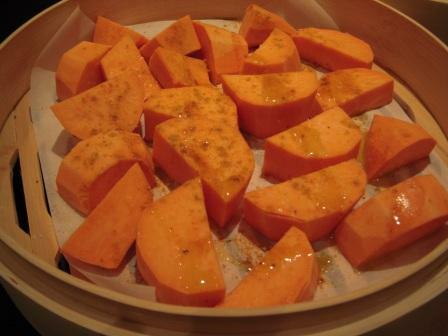 On the next layer, I put some chunks of sweet potatoes (red garnet, my favorite) with a little EVOO, salt, pepper, and sprinkle of curry powder. Because my fish fillets were so thin, I decided to let the potatoes get a good blast of steam before I added the fish to make sure it was all done at the same time. potatoes on alone - be sure to put the lid on! While the potatoes cooked, I washed some spinach and put it on the serving platter. After 5 minutes, I added the fish basket to the top and let it go for another 5 minutes. I put the hot fish & potatoes on the spinach to wilt it just a bit. 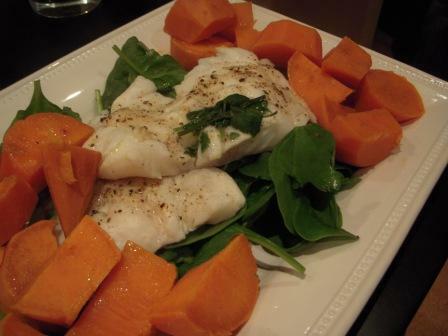 After 10 minutes prep, and 10 minutes cooking, I had a healthy, tasty, beautiful meal on the table!